At pMD, we think it’s important to stay connected with the local community and are always looking for new ways to support young innovators in the Bay Area. To that end, two weeks ago I had the pleasure of being a judge at the 2014 Santa Clara University School of Engineering Senior Design Conference. This annual event, hosted by my alma mater, showcases the capstone projects of the graduating seniors in all five disciplines of the School of Engineering. It’s a fun-filled afternoon where students get to show off the results of their hard work. 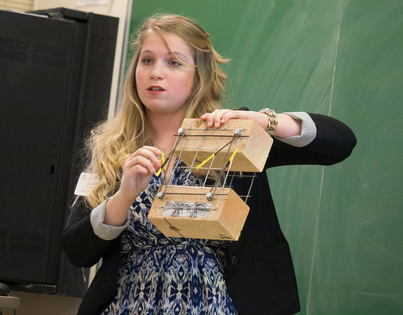 The presentations this year ranged from straw bale construction for sustainable building, to 3D printing techniques for creating anti-MRSA agents, to designs for low powered, affordable cell phones for the homeless. Photo by Charles Barry, Santa Clara University Photographer. The conference is set up as a competition. With family and friends looking on, teams present their projects to a panel of judges. The students have about 25 minutes to demonstrate how their idea leverages what they’ve learned over the last four years to uniquely solve a meaningful problem. Their final score takes all this into account, as well as how engaging and polished the presentation was in the opinion of the judges. As a one-time presenter and winner myself, I was really excited to see what the students had come up with this year. I wasn’t disappointed. I got to watch five groups of Computer Engineering students. If there were an overarching theme to these presentations, it would have been using computer technology for social good. One of my favorite projects, called “Text to Learn,” was a system for sending training materials to students via SMS. Its builders had spent time in countries in a number of emerging markets and had noticed that while most people didn’t have smartphones, most did have SMS-capable feature phones. Their software had the ability to transmit training manuals piece by piece, and could then administer a quiz covering that material. Other highlights included a web-based stress tracker, which was designed to help people from at-risk families monitor and manage their stress levels, and a mobile app called “Youth StreetConnect,” which was built to help homeless women find nearby health services. All of the teams had worked hard to put together great presentations, so choosing a winner was extremely difficult, but in the end we decided that the “Text to Learn” group had the best combination of a great idea and a well-executed presentation. 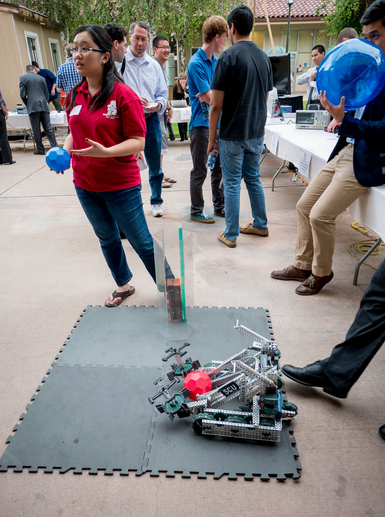 After the presentations, teams had the chance to exhibit their projects in the engineering quad for everyone to see. It was great to walk around and check out all of the cool ideas that the students had come up with. It’s also exciting to think that in a matter of weeks many of these seniors will be going to work here in the Bay Area, or elsewhere, and applying their amazing creativity to a whole range of companies and products. I hope we at pMD get the opportunity to work with some of these great people!